Something strange has happened. The Patriots coach, it seems, can’t stop talking. Bill Belichick has given elaborate — and informative — answers during news conferences since training camp started. Bill Belichick strode to the podium on July 29 and greeted a room full of reporters with his first words of the 2015 season. “It’s good to see everyone back here,” Belichick said. Ha ha, very funny. Now back to the grumpy, monotone, “On-to-Cincinnati” persona that we’ve all grown to expect from the Patriots coach over the last 15 years. Except something strange has happened this season. Belichick, it seems, can’t stop talking. 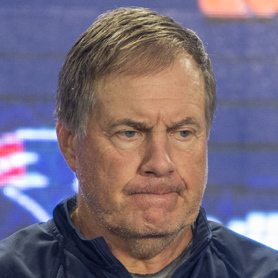 Belichick is required by the NFL to talk five times per week — after each game, and on four other days. 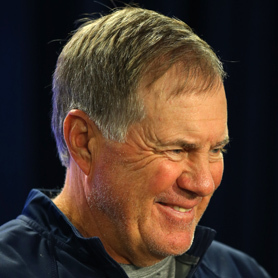 And many his news conferences and conference calls have been surprisingly good this season, with Belichick consistently giving detailed and candid answers about how he runs his team, evaluations of players, lengthy explanations of seemingly mundane details, and how certain situations unfolded in games. Believe it or not, he even cracks the occasional smile. The Patriots coach has given more of a window into his football mind this sesaon than in years past. 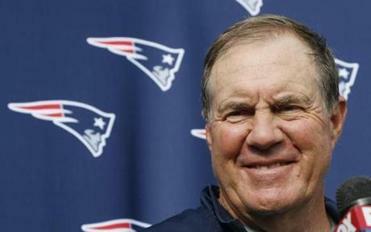 “Yeah, I always have a smile here on Wednesday,” Belichick said before facing the Bills. In October, Belichick gave an 889-word response, lasting more than eight minutes, about the preparation involved in the decision to replace an injured offensive tackle with either a guard or a big tight end. “Honestly, I think it would be pretty irresponsible if we got a player hurt and then we had a meeting on the sideline like, ‘What are we going to do?’ ” he said. In November, he was asked about the NFL possibly expanding rosters next season, and in a 926-word diatribe he bemoaned the increased specialization of football players and explained that expanding rosters won’t help teams if they lose star players to injury. “Sorry to take so long on that,” he apologized afterward. 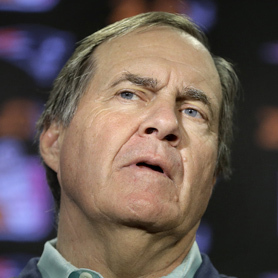 And if you really want to get Belichick going, ask him a question about special teams. The question, “After one preseason game, where are you at in the kicking game?” produced a 550-word response. In November, a question about how to field a punt deep in your territory produced a 628-word answer. “It’s certainly an interesting point of discussion, and . . . there is certainly variability on that subject,” Belichick said after speaking for seven minutes. He jokes with the skeleton crew of reporters who show up for his Friday 9 a.m. news conferences, calling them his “Friday warriors.” He even went out of his way, unprompted, to thank the media for its coverage when the Patriots practiced on Thanksgiving morning. “I appreciate the professional way that this group covers us, and being the conduit of information from the team to the fans,” he said. Of course, Belichick’s players say the coach hasn’t gone soft with them this season. 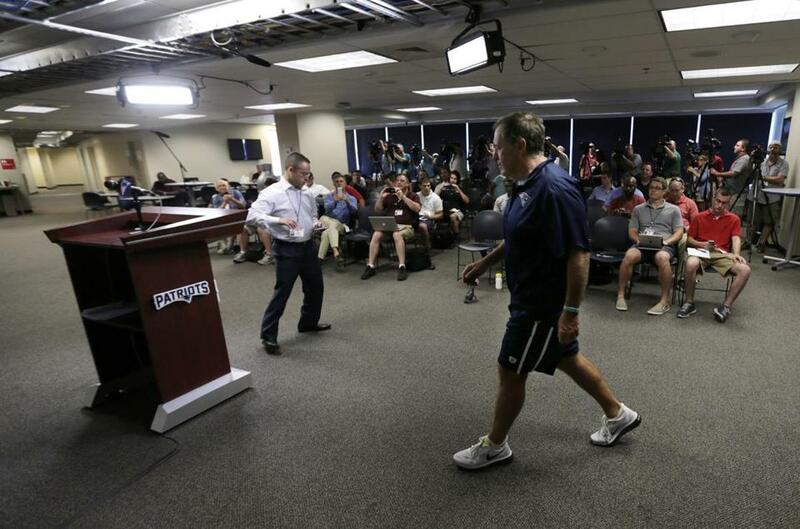 Belichick walked to the podium to address the media July 31 during training camp. This is Belichick we’re talking about, right? “Just trying to be cooperative and help you out,” he deadpanned on Dec. 2 when asked about the statement the team released about Rob Gronkowski’s injury. The general rule of thumb for years in Foxborough was that Belichick was always pretty good on Fridays, when most of the preparation for the week is complete. But this season even his Wednesday news conferences can be filled with humor, anecdotes, and insights. So, what gives? Theories abound: He’s a happier guy now that he’s won another Super Bowl; it’s hard to be grumpy when your team starts 10-0, and now is 12-4 and has a first-round bye; he’s filibustering to get through the news conferences with as few questions as possible; and one longtime Patriots media member jokes that Belichick knows this is his last season coaching. Of course, there are still topics he won’t touch. Don’t ask him about Deflategate or Brady suing the NFL. “You heard what Robert [Kraft] just said. It’s already been addressed. 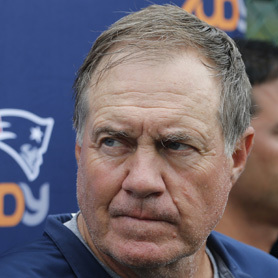 Maybe you ought to go back and look at your notes,” Belichick said. Don’t ask him how he has evolved over 40 years as an NFL coach. “I don’t know,” he answered. And definitely don’t ask him about the bye week before the bye week arrives. “Honestly, we’re not even thinking about the bye week right now,” he said. But to listen in on Belichick’s news conferences this season is to get a master’s-level education from one of the smartest football minds in the world. He’ll go in-depth on the fundamentals of football, and game management (at least when the team wins). In September, Belichick went five straight minutes and 499 words on the five skills needed for cornerbacks to consistently deflect passes. After the first Jets game in October, he described how Julian Edelman got inside split safety coverage and Brady delivered the ball with perfect anticipation to convert a crucial third-and-17 play. Also in October, Belichick described his philosophy for when to go for 2-point conversions. Two Thursdays ago, while wearing a Bruins knit hat in advance of the Winter Classic, Belichick unprompted told us all about his hockey days in the “huff-and-puff” league when he was a coach with the Giants. He then, of course, transitioned into a 192-word lecture on the differences in scheming defense in football vs. sports with a goalie such as hockey and lacrosse. 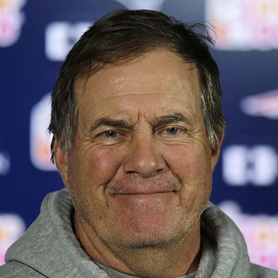 Belichick is required by the NFL to talk to the media five times per week — after each game, and on four other days. Belichick also gives a surprising amount of insight into how he runs his team. When facing an uncommon opponent early in the season, such as Jacksonville in Week 3 this season, he and his staff study film starting in April. “We spent a lot of time on Jacksonville. I’ve seen probably well over half their season from last year,” he said. In a normal week of preparation, his team studies 300-400 of the opponents’ previous plays on each side of the ball. He went on for seven straight minutes about how he evaluates and scouts opposing kickoffs when so many of them are kicked out of the end zone. Belichick said he could “talk for weeks” about how he teaches his players all of the new rules each year. He went for five minutes straight about how he coaches important situational football each Saturday before a game — reviewing safety kickoffs, squib kicks, and other uncommon situations. “Usually over the course of three to four weeks, you can pretty much get them all,” he said. Belichick detailed how important it is to evaluate players based on their current ability and production. We discovered his thoughts on the new offseason practice limitations, spelled out in the collective bargaining agreement. “From the end of the season to the middle of April, we can’t work with the players. We can’t do anything with them. We can’t instruct them. So, that’s the way we wanted this CBA created,” he said. “So that’s what it is. There’s no coaching, there’s no guiding or getting players to do whatever it is you want them to do in the offseason. There’s zero of that from the team, and then all of the sudden they show up here in April, and all of a sudden it’s like, well, there’s some problems. He also detailed the most important lesson he learned from working under Bill Parcells. 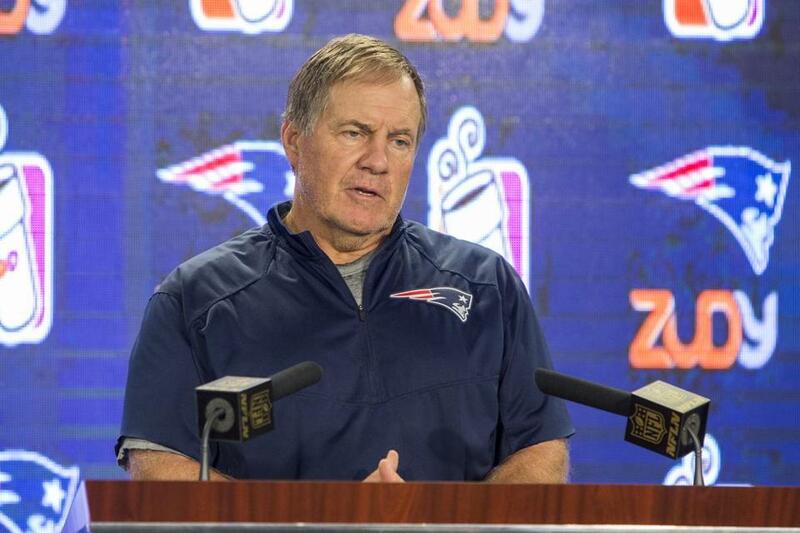 Belichick still doesn’t discuss much about injuries or roster moves until after they have happened, but last month a reporter pressed his luck. “I have another [question], but I didn’t think you’d like it so I didn’t want to end with it,” the reporter said. “You want to end on a high note? No problem, I’ll go out on a high note then,” Belichick answered, channeling his inner George Costanza. 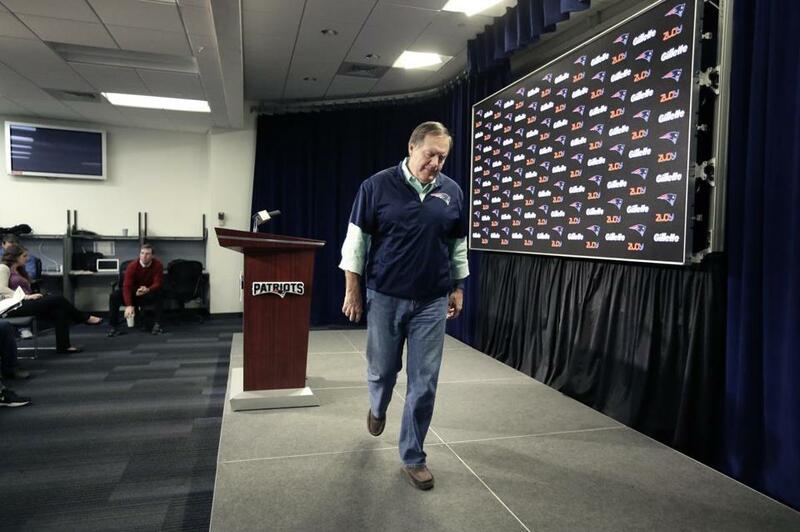 “Let’s just end on a high note,” Belichick said smiling, walking off. Click each picture to read Belichick's full answer. How do you rate your special teams progression after one preseason game? What traits does a cornerback need to have good ball skills? How consistent is what athletes learn at performance centers in the offseason? What's the process of deciding to how replace an injured offensive tackle? How would you benefit from the 46-man, the 53-man or the 90-man rosters?